1) In the deep water: floating vegetation or plants with floating leaves such as waterlilies and bog ferns; while the Lamette have reeds and submerged meadows towards the open water of the lake. 2) In shallow water (both the shallow basins and sloping banks): dense carpets of plants with floating leaves, above all waterlilies, but also cane-brakes (the most tipical formation) sometimes preceeded by clumps of cattails and beds of rushes and reeds. Often in these waters there is a rich submerged vegetation. The evolution of the vegetation in this environment is extremily rapid and in the intermediate phase of the total occlusion. 3) Periodically flooded areas; very frequent near the cane-brakes in the Lamette, less so in the Lame; luxuriant sedge fields consisting of Carex Elata which is the most characteristic type of vegetation in the Reserve, especially in the Lamette. Certain plants such as Ophioglossum, Allium Angulosum, very large ranunculis are still to be found on some internal banks. 4) Internal banks; Butomus, Sagittaria, bog ferns are ornamental elements of this landscape. 5) Muddy depressions and dry muds are vegetated by small ciperacae. 6) Water meadows: this is the original appearance of the Lame, but is now reduced to sparse remains of fields with tall grasses, infrequently cut, characterised by Cyperus Longus. 7) Fields, stabilized following cultivation but still tend to be water logged. 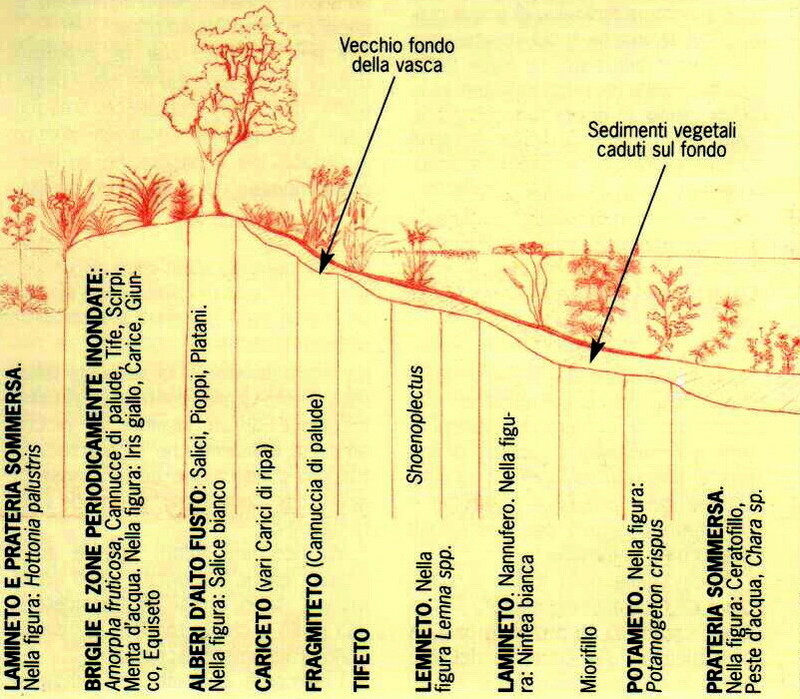 These are semi-natural environments which form an introduction to the areas with more “characteristic” vegetation. With the exclusion of the completely acquatic areas, the vegetation tends to be hygrophilous woodland (including species such as willows, poplars, alders and glossy buckthorns). 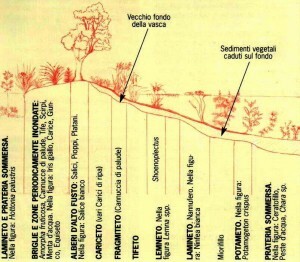 It is one of the main features of the vegetation of the Torbiere. It is a perennial plant with a large horizontal rhizome that yields stems one to three metres long. The rhizome produces a drug with sudorific and diuretic properties. But the local populations used the inflorescence of this plant, a dense spike that grows on the tip of the stem and can be up to 50 cm long. This is not a limited local use, and it has been immortalized by the name commonly used in Italy for this plant, canna da spazzola (brush reed) or simply spazzola (brush) and similar names in the local dialects. Especially after the war the men used to cut these reeds in the Torbiera and the women using rudimentary finger-covers made out of inner tubes of tyres, took off the leaves on the spot; then the men cut the leafless stems at about 30 cm below the spikes; at this point the “smanse” were taken home and left to dry in the shade. They were then sold to the people that in those days came all the way from the Mantova area buy them and were used to make brooms and brushes. They were traded until synthetic fibres were introduced, even though some people carried on cutting the reeds up to very recently, still finding a place for them on the market.